I like my peppers in Crayola colors, red, orange, yellow, but not green. 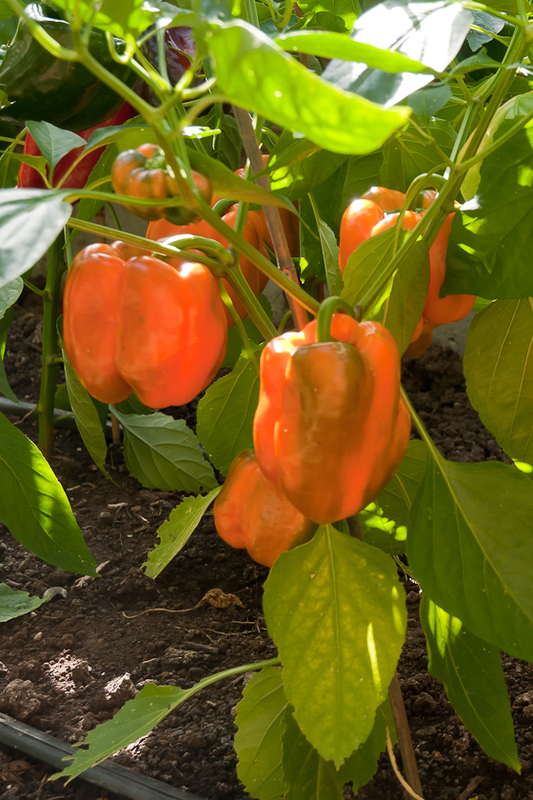 Of course they all start out green, but the pleasure is in watching them turn from green to these brighter colors that signal ripeness and spicy, sweet pepper flavors. Green peppers, which many people like, taste too harsh and bitter to me so I wait the extra few weeks for ripening. I wouldn’t be writing about ripening peppers if I didn’t have a greenhouse and a low hoop-house for additional plants. 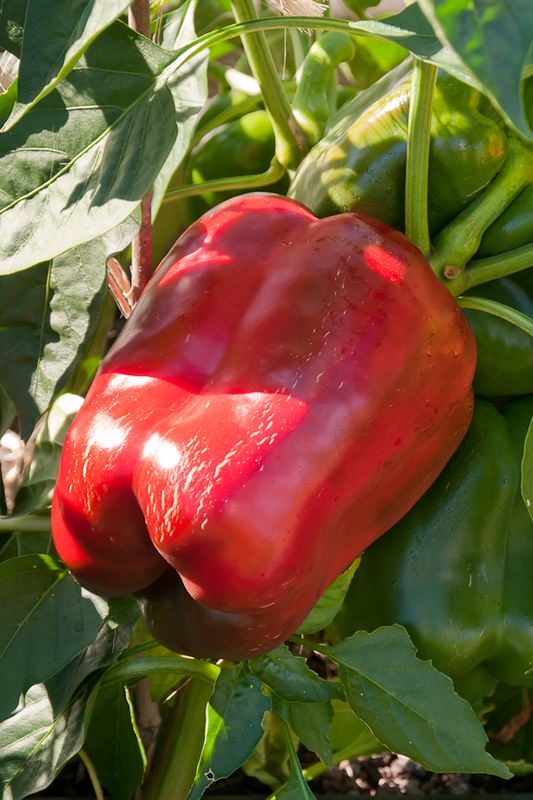 In our cool climate, these heat-trapping structures are what peppers need to thrive. This year, I started pepper seeds indoors under lights in mid-March, transplanted them to the greenhouse and hoop-house in mid-May and harvested the first peppers in mid-August. They’ll continue to ripen into October. Every few years, I try some new pepper varieties and this year brought me some winners: Carmen, Revolution and Flavorburst. 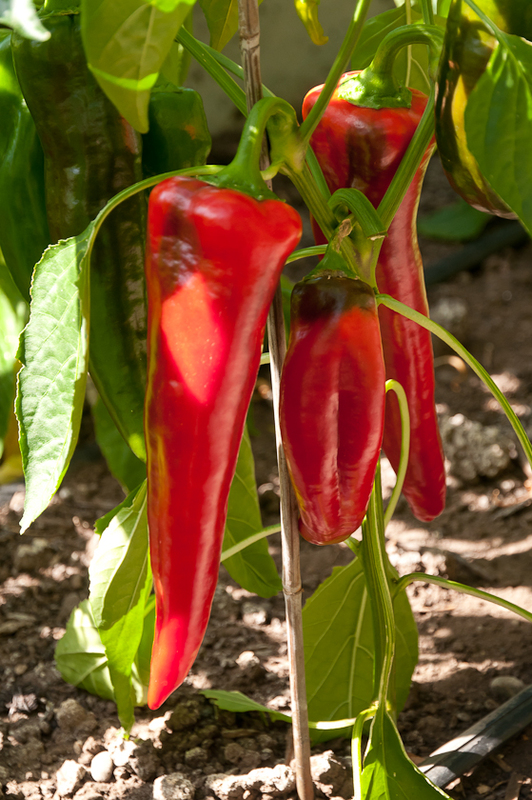 Carmen is a red Italian pepper, a corno di toro or “bull’s horn” type, long and pointed and fairly thick-fleshed. It was the earliest of all this year’s peppers to turn red and even better is really tasty with a strong sweet pepper flavor. It’s great raw but also fries and grills well. It was developed by Johnny’s Seeds and won the All-America Selections award in 2006. Revolution is an enormous red bell pepper, the largest I’ve ever grown. When I saw how big the forming peppers were becoming, I wondered if they would ever turn red but they did. It’s thick-walled, juicy and spicily sweet. We took a bag of sliced Revolutions on a couple of hikes recently and their crisp juiciness was really welcome after a hot climb. I haven’t grilled any yet but I’m anticipating that the skin will blacken easily and slip off leaving even sweeter pepper flavor. I bought the seeds from Fedco. Flavorburst is a yellow pepper. In Fedco’s description, it “begins the color of Granny Smith apples and ripens to a lovely shade of goldenrod.” It’s thick-walled and juicy and its sweet pepper flavor has a hint of citrus. It’s delicious raw, roasted or grilled. 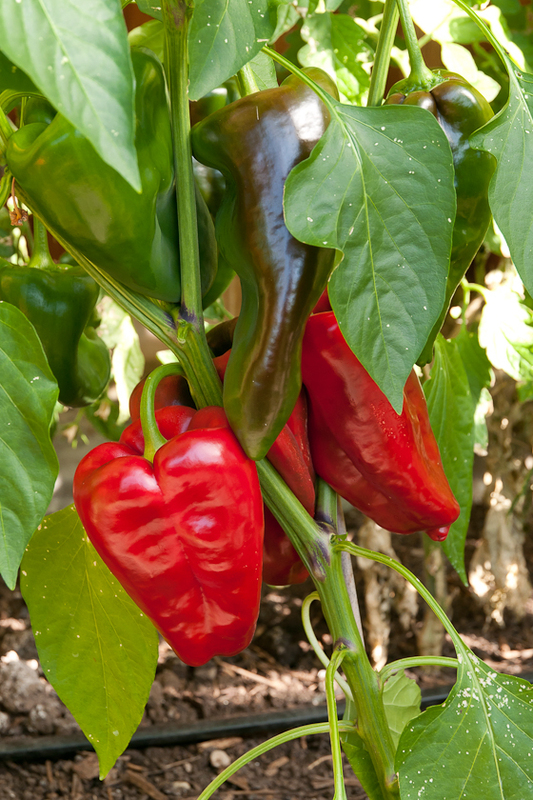 I’ll add these three to a couple of long-time favorites I’ve grown for years: Gourmet and Ancho Magnifico. 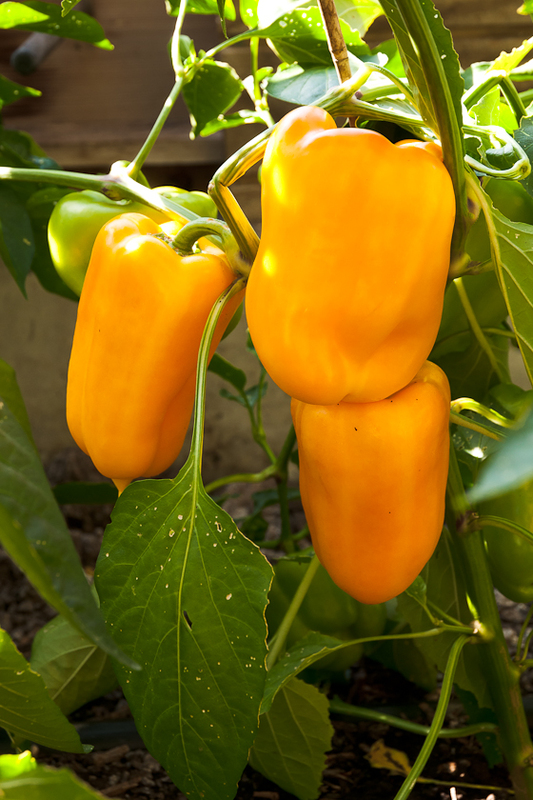 Gourmet is a beautiful shade of orange and rounds out my trio of red, orange and yellow peppers. A sweet bell like Revolution and Flavorburst, it’s also spicier than either. Johnny’s sells the seed. 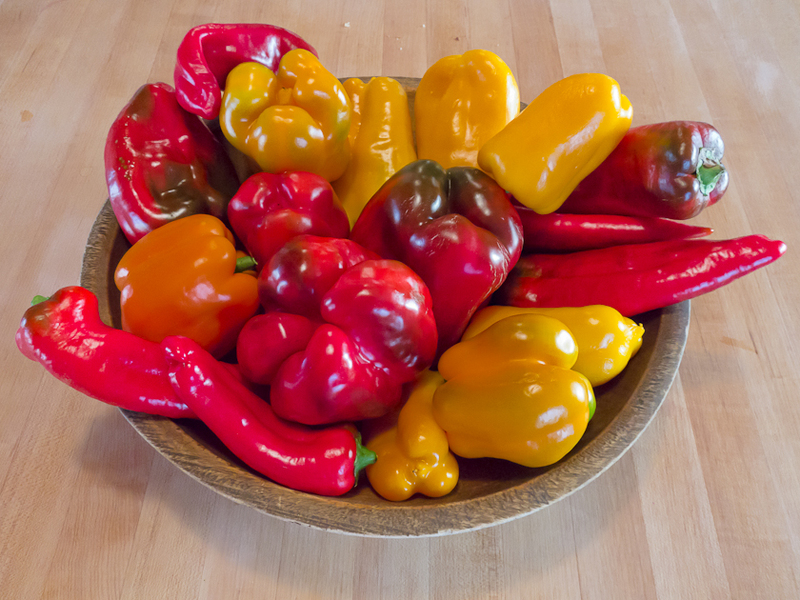 Raw, these three peppers make a colorful plate of snacks. Roasted, skinned and sliced they are striking toppings for crostini, pasta or pizza. And sautéed with yellow onion and bound together with a little tomato sauce, they make a sweet pepper stew that has become my most-requested summer potluck dish. While there are many recipes for this dish, the one I’ve used for years is from Nancy Harmon Jenkin’s Flavors of Tuscany (1998). • Thinly slice two medium yellow onions and gently sauté them in three tablespoons of olive oil over medium-low heat until soft and golden but not brown, about ten minutes. • Add the pepper slices with a little salt and pepper, cover the pan and cook for about twenty minutes or until the peppers are soft and just starting to brown. • Remove the cover, raise the heat to medium or medium-high, add the tomatoes and cook, stirring frequently until the tomatoes reduce into a sauce. As Jenkins writes in the introduction to the recipe: “Embarrassingly simple preparations like this one illustrate the Tuscan principle that good food only comes from good ingredients.” She’s right. One more reason to grow a garden. Finally, there’s Ancho Magnifico, a poblano chili pepper from Territorial Seeds that starts out green but turns red as it ripens. At the green stage, it can be made into chili rellenos, but I prefer to wait until it turns red. The flavor is both sweeter and hotter then. I grow more of these peppers than any of the others. As they ripen, I’ll put a dozen or so on the grill, blacken the skins and then pile them in covered bowls to sweat. When they’ve cooled, I slip off the skins, pull out the stem and then slit open one side of the pepper and spread out the flesh so I can remove the seeds. Then I fold the flesh back into pepper shapes and freeze them. The flesh is still firm after it thaws. Wrapped around fillings like pureed winter squash or mashed potatoes then baked, it adds a spicy bite to these milder, sweeter vegetables. 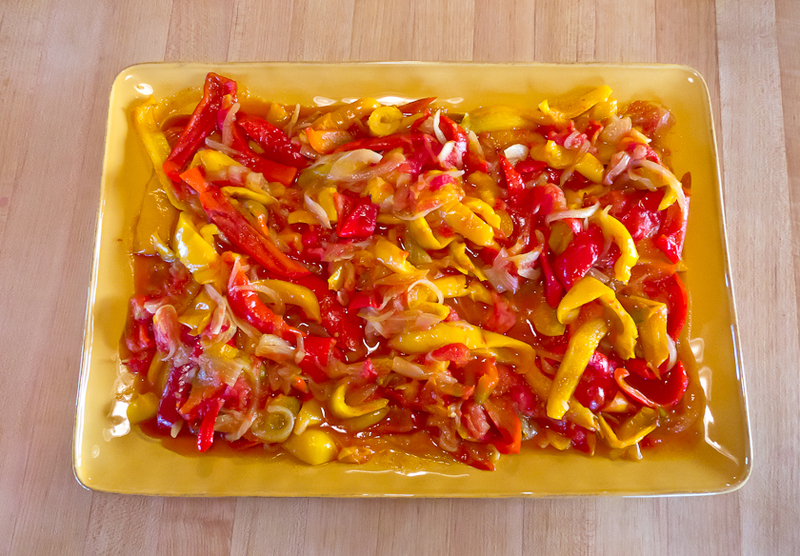 I also roast and freeze sweet peppers and use them just as I would fresh roasted peppers. Peppers are one of the pleasures of summer eating, but it’s worth taking the time to preserve a few to carry a taste of summer into the middle of winter.